Well igg isn't all that reliable, they like to delay a lot. not really, probably wouldn't even be 1 million dollars. Take them out with Love. One by one. It's quite fascinating. The way people speak. The way people act. The way people just...live. People are different. You see hundreds of cultures all over the world. Some differ by a small percentage. Others can be completely the opposite of another. We think what we think. We do what we do. This all pertains to the function of the brain. Thinking. Then the possible question forms from the confines of some minds. "What if.....?" Yes indeed, what if? What if I did this? What if I did that? How would this benefit me? How would this put me at a disadvantage? What is the purpose of this? The human mind is a very complex thing. It could form millions of thoughts in just one single second without the owner even realizing all but..one. And what is this one thought? This one outlier in the mathematical functionality of the brain? This is what we think. Out of all the possible thoughts, this is the one thought we think about at the present moment. And what is the result of this thought? Success. Failure. Love. Hate. Passion. Determination. Character. Personality. Actions....Death. I would be really thrilled if some of those new quests were for pet scroll quests. I'm a bit disappointed though, the new version (if it even comes out) will most likely take forever, and if it does come out, it'll have nothing good available, no new pets, no new features, nothing, just week-long 2x and a few quests here and there. finally ! been waiting ages for this ! Not as excited as before but still..
And i told myself i will save up but being me i couldn't help myself T.T bought 2 new items lost my millions of $ and am now left with only a few hundred thousand ._. oh well it's ok.. i'll get the items one day xD besides above all, the main one i want to get will probably be worth the rest of my money xD most likely more.. but that's the one item I will get before any other even if it's just that one item xD i want it more than the others >| !! looks like soldier clothes...I'm not sure, might not be, I've only seen it on girls. cool, I assume you got it from doala? But I'm not sure if I can do her death quest fight. WHat new on this "new version"
NOTHING oh no !! there something NEW COLOUR OF EQ !! well if you are complaining, why would you still play wlo, and if you aren't playing, why would you be on a wlo-related site. Sure it took them forever to update a new patch, but something is better than nothing. This is not a new version It is version 6 Special edition aka a minor update to the existing version that adds some new items, a few new quests. But unless you are not going to play no more. Something is better than nothing. Here's my vicky at lvl 7. My Vicky's damage with a sky sword (no forge) and crit, no cuss or freeze. 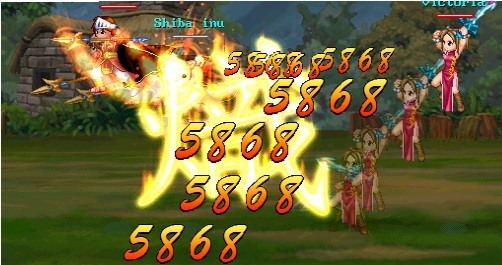 Btw: She hits once before she begins that big chain of damage so JL do the math. My Combo with Vicky, both crit, Vicky wearing my ears, me wearing her crappy def helmet. Very nice, :o I can't wait to see your vicky too. >| Hopefully I might hit :D 80+ this weekend, idk, I will prob train 24/7 and I have a few 10x's and 5x's stored for 2x.